Update 2016-05-09: This tutorial is now obsolete. Please refer to MetaTrader Indicators — User’s Tutorial for MT5 indicators installation instructions. 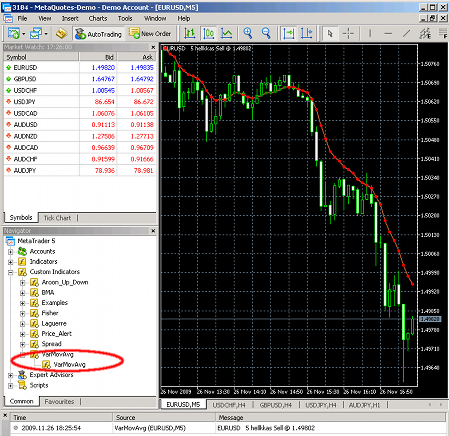 This tutorial covers only MetaTrader 5 indicator installation. If you need info on MetaTrader 4 indicator installation, please, refer to my previous tutorial. So, you’ve downloaded some MT5 indicator and have no idea how to install into your trading platform? Read this tutorial to know how. 1. Make sure you have either .mq5 or .ex5 files of the indicator downloaded. You can’t install an indicator before downloading it. 2. Go to your MetaTrader platform’s folder (wherever you installed it; usually, it’s C:\Program Files\MetaTrader 5). If you are using Windows 7, then you should copy your indicators to other location (usually, it’s C:\Users\USER NAME\AppData\Roaming\MetaQuotes\Terminal\MetaTrader 5\MQL5\Indicators). 10. Now you can enjoy your new MT5 indicator and, hopefully, better Forex trading results. If you liked the tutorial or don’t understand something, or have other problems installing indicators into your MetaTrader 5 platform, feel free to leave your replies and ask your questions via the commentary form below. thanks for guiding ,I installed mt5 but sorry to cant get the mean of describe to putting indicator in chart page . could u please guide me more clearly to seeing indicator for buing and selling’s poing ? Did you read the tutorial above? Realllly with this clear tutorial only I was able to include my favy .mq5 indicators for my convenience.Thank you very much and please keep this up for ever. Am begining to like this..
Can you send me a link to your indicator? Or at least provide a screenshot of the error and other relevant screens? and as I said using windows explorer I created folder in: MQ5-Indicators and paste indicator….When I open metaeditor I dont see neither new folder nor indicator in that folder…Why? Host both indicator and the screenshots on some file sharing hosting and post the links here. Unfortunately that’s not possible to do it correctly without ruining the blog with poorly sized attachments. While it’s not that hard to upload an image to http://tinypic.com/ in 3 clicks and copy the link here. 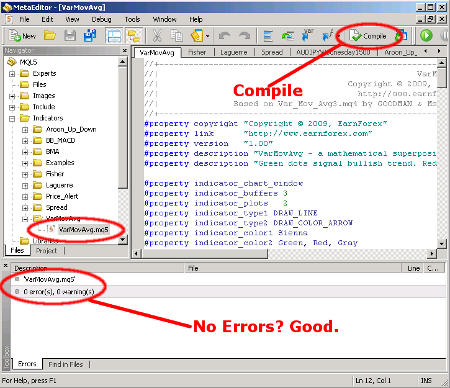 Hi,I am getting problem in installing the indicator called pattern recognistion for the candles.As you have told in tutorial i have tried all that options.But the option of compiling, i was not able to open the .mql5 file in the editor…i tried to access but in that location of folder in my laptop editor does not able to access the file. I can’t find the “patern recognition” indicator using the link that you’ve provided. Can you, please, post a direct link to the indicator? Why can’t you open it in the editor? What did it say? Was the file there? У меня тоже было такое. На Windows 7 индикаторы добавлять сюда! Если они в формате *.mq5 – отркыть в MetaEditor и компилировать. What I know the main thing that Metatrader 5 and Metatrader 4 have in common is that they are designed to provide brokerage services to customers in Forex, CFD, and Future markets. Aside from that, what else does Metatrader 5 and Metatrader 4 have in common? Why do you think Metatrader 5 is very useful to the clients? If you would range from 1-10, where does Metatrader 5 belong? Basically they are very similar. It’s much easier to tell their differences than their similarities. I’d rate MetaTrader 5 at 7 or 8 out of 10. Спасибо огромное!!! На других ресурсах провисел пол часа, а тут нашол на английском, и потратил пару секунд, запуск мета и компила))) !!! Здравствуйте, как мт4-индикаторы установить в мт5? Спасибо. К сожалению, никак. Нужно почти полностью переделывать исходный код индикатора. It seems there should be a way to tell MetaEditor to reload indicators or something like that. pouvez vous svp m indiquer comment placer mes indicateurs mt4 dans mt5 j ai essaiyé mais ca marche pas . y a t il un programme de transformation des indicateurs mt4 en mt5 ? Sorry, I do not speak French. Is what you ask is how to get MT4 indicators work under MT5? If so, then I must disappoint you. MT4 indicators have to be recoded almost completely to work in MT5. You probably need to reinstall your MetaTrader 5. You can try MQL5 Jobs website for that. Alternatively, you can just post the indicators’ MT4 source code on our forum and, perhaps, someone will be able to help you for free. Why does PositionSizeCalculator not show any data in Chart window when Indicator is dragged and dropped from the Navigator? Is there any output to the Experts tab at the bottom of your terminal? Is MetaTrader connected when yoг try it? What version do you use – MT4 or MT5? Hello admin, I have an error using MT5 in Windows 8, and trying to install the Position Size Calculator. Could you help me to find a solution, please? Thank you very much. You should enable Windows to show hidden files/folders via folder properties. Thanks I have install it. I don’t know what do you mean by “saving” them, but adding the currency pair to Market Watch is easy. Right click somewhere in the Market Watch window and choose Symbols, then just add the currency pairs you need. What is T3-tilson indicator, Where I can find it. If available, will you please send me the same. Sorry, no idea about “T3-tilson” indicator. Great tool but is leverage taken into account with this tool? There isn’t a parameter I can see that I can adjust to my accounts leverage. What tool do you mean, Daniel? It was for the Position Size Calculator. No, Position Size Calculator does not need to know your leverage to calculate position size based on your account balance and risk tolerance. Your leverage only affects the effective maximum position size you can afford to open. Thanks for the clarification. Not sure why I even thought the indicator needed to know leverage. Brain freeze moment! That’s quite normal for traders to become confused about leverage/PSC. It was a big confusion for me too when I developed the tool :-). Hello, I have a problem here. I’ve downloaded from your site the Laguerre Indicator as .mq5, followed this tutorial and at manual Compile it shows me 1 error (ex5 write error) and I’m not able to see the Indicator in the MT5. What could be the problem? Thanks already in advance! It looks like your MT5 does not have enough rights to write files to the directory where .mq5 file is located. You should rather make the directory where you want MT5 to write files to be writable by user SYSTEM via Security options of the folder. To fix the error EX5 WRITE ERROR you need to give administrator rights for the Metaeditor and MetaTrader5 programs. Find the aplications > right click Properties > compatibility > and mark the box to give administrator rights! I hope to help you guys! And sorry for the english, I’m from Brazil. Please make sure that the entire folder PositionSizeCalculator (with all three files in it) is copied to your /MQL4/Indicators/ folder. Your directions seemed clear however after saving supply demand mt4 indicator.ex4 in my metatrader 5 platform to the indicator folder it does not show up in navigator after refresh. Would this be due to it showing as .ex4 file? If so any way to rename it so it would work. Sorry, but you cannot use .ex4 files in MetaTrader 5. MetaTrader 5 only works with .ex5 files. It requires the source code file (.mq4) to convert it to MT5 language (.mq5) and the process is usually non-trivial. I cannot change “position Size Calculator” for short position ? Why? As long as the stop-loss is above the entry and the take-profit is below the entry, it will show calculations for a short position.